Marilyn Joanne Schmalz passed away on Tuesday, November 13, 2018, at the St. Croix Regional Medical Center surrounded by her loving family. Marilyn was born on January 16, 1931, in Star Prairie, Wisconsin to her loving parents Melver and Clara Pearson. She was baptized and confirmed at West Immanuel Lutheran Church and remained a faithful servant of the Lord throughout her life. 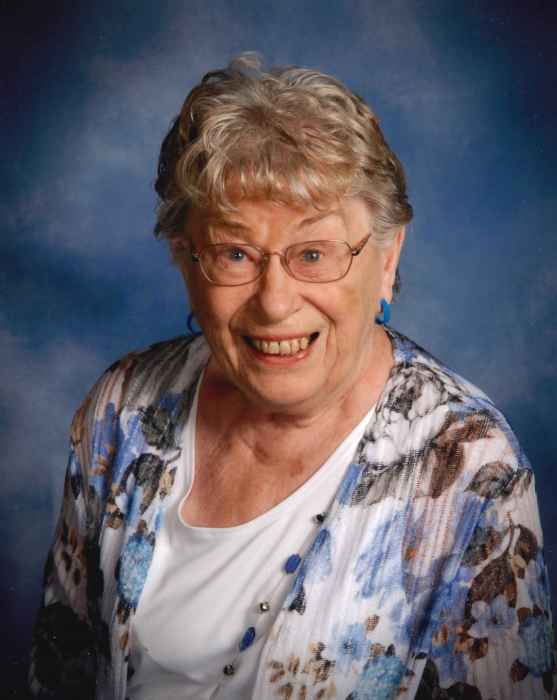 After graduating from St. Croix Falls High School in 1949, she moved to St. Paul to pursue a career in bookkeeping and accounting, working for various companies including the fledging Northwest Airlines. She met the love of her life, Richard Schmalz, in 1950 and they were married at Fristad Lutheran Church on February 17, 1951. Following their marriage, they settled in St. Paul, moving to Denver when Richard entered the Army. Following his discharge, they settled on a farm in St. Croix Falls because raising their family in the country was important to them both. Their union was blessed with four children and the family grew in later years to embrace eight grandchildren, thirteen great grandchildren and one great-great grandchild. Marilyn’s heart was big enough to hold and nurture each and every one. As a wife, mother and grandmother, she was ever loving, kind, gentle, thoughtful, patient and supportive. Marilyn was a woman of deep faith in her Lord and always willing to serve her community. She was active throughout her life at Fristad Lutheran Church, receiving the Lay Service Award in 2014. In her later years, she greatly enjoyed her work and the friends she made at Interfaith Caregivers, which continued until two years before her passing. Marilyn was creative and enjoyed many activities: painting, reading, cooking, camping, fishing, pontoon boat rides around the lake, bonfires and games of all kinds, especially if those activities involved any member of her extended family. She was up for almost anything and graciously played along with her grandkids even when they thought they were in charge. Marilyn leaves to celebrate her memory her Husband of nearly 68 years, Richard Schmalz ~ St. Croix Falls, WI; Children, Deborah Schmalz and husband Steve ~ Champlin, MN; Steven (Gina) Schmalz ~ St. Croix Falls, WI; John (Julie) Schmalz ~ Shafer, MN and Mark (Karen) Schmalz ~ Charleston, SC, Grandchildren, Joshua ~ Michael ~ Tabitha ~ Ashley ~ Jenifer ~ Jessica ~ Jacob ~ Theresa, Great-Grandchildren, William ~ Leo ~ Fiona ~ Andrew ~ Anastasia ~ Drake ~ Francesca ~ Lilliana ~ Ryder ~ Caleb ~ McKinley ~ Tyler ~ Abigail , Great- Great Granddaughter ~ Adrienne and Brothers and Sisters-in-law, Tim (Mary) Schmalz, Gretchen Schmalz and Ruth (Cliff) Krueger and other family and friends. She was preceded in death by her Parents, Melver and Clara Pearson, Sister-in-law, Meredith Morgan and Brother and Sister–in-law, William and Carol Schmalz. A Celebration of Life for Marilyn will be held on Friday, November 16, 2018 at 11:00 A.M. at Fristad Lutheran Church in Centuria. Pastor Valerie Peterson will officiate. Visitation will be held at the church from 10:00 A.M. until the time of service. Following the service the family invites their guests to join them in the fellowship hall for lunch and continued visitation. Internment at Fristad Lutheran Cemetery will occur in the future. In lieu of flowers, memorials are preferred to either Interfaith Caregivers or Fristad Lutheran Church. Arrangements were entrusted to Kolstad Family Funeral Home of Centuria, Wisconsin.